It's a nearly unheard-of scenario: a San Francisco construction project finishing ahead of schedule. 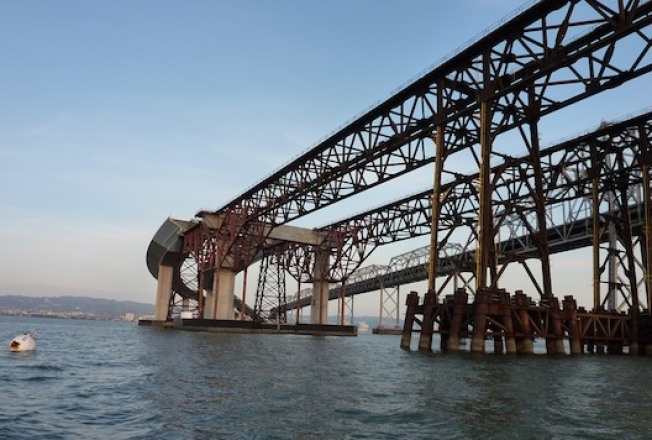 Technically, the project is just outside the city: it's the eastern span of the new Bay Bridge, stretching from Yerba Buena Island to the East Bay. Initially slated to be done in mid-2014, planners are now on-target for late 2013. So, start stocking up now on bottles of champagne, or however people celebrate bridge-christenings. The early completion will cost a little extra -- about $106 million, according to the CC Times. But there's plenty of money in the "rainy day" contingency fund, currently around $320 million, to cover the accelerated time frame. Meanwhile, other major infrastructure projects are inching along. Though the site of the new Transbay Terminal remains a big hole in the ground, a new sculpture is in the works for the corner of Mission and Fremont. Resembling a giant robot, the sculpture will be constructed out of debris salvaged from the old terminal. It's scheduled to appear sometime in 2015, with the terminal completed in 2017.